I've had this old wheelbarrow for close to 20 years. I paid $15 for it at a garage sale. I treat the wood with THOMPSONS WATERSEAL Wood Protector every couple years to make the old wood last as long as possible. You can also brush or spray Thompson's on handles of garden tools as well. This is my newly planted wheelbarrow 2017. In the center of the laundry tub is Hard Rush "Blue Arrows" Ornamental Grass, and Saratoga Series Nicotiana and annual Phlox planted around it. This is my first try with the rush grass. I am hoping to use it for height as I would a spike. The Nicotiana and annual Phlox are two underused annuals nationally that I try to use every year. My reasoning for under use of nicotiana is how ugly the bedding plants appear when not in full bloom. This photo is from 2004. I could find plain red nicotiana back then and not just mixed color six packs. 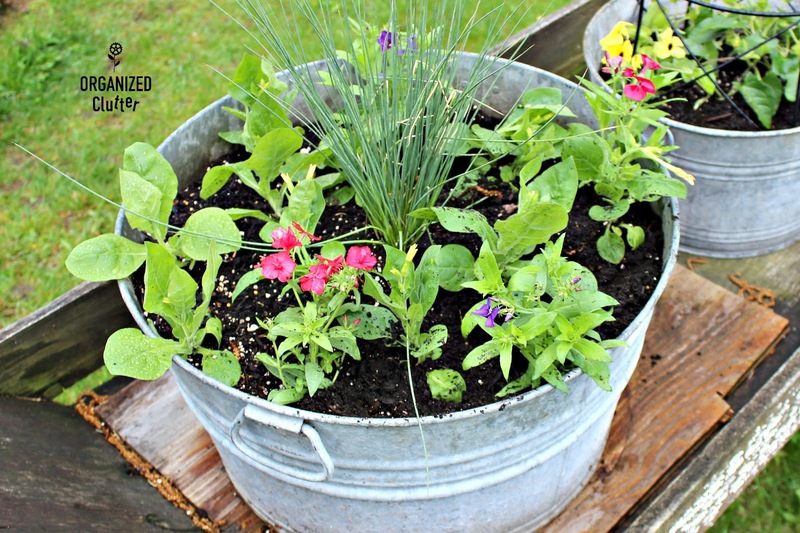 The center of the tub is planted with heliotrope. Heliotrope has a great vanilla scent but are deer magnets. Another gardening season the red nicotiana were centered by pink Gaura with Techno--Heat Light Blue Lobelia around the edges. 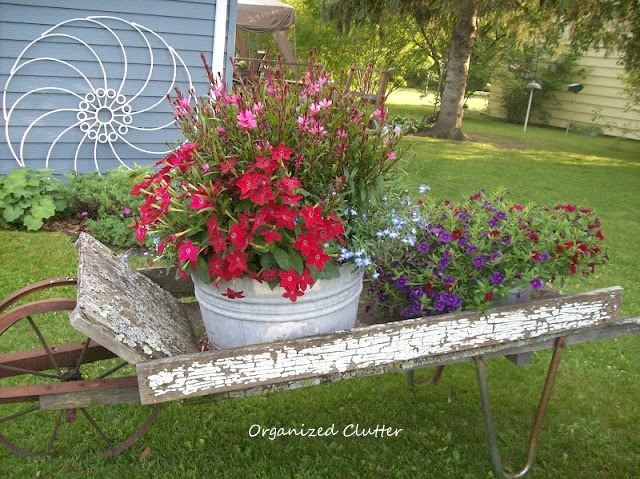 This season the nicotiana moved to the smaller square laundry tub and calibrachoa and a vintage wringer occupied the larger round tub. This season I went crazy with nicotiana, annual Phlox, pink zonal geraniums, coleus and Creeping Jenny. While it was pretty, the wheelbarrow didn't ever dry out with all the hanging plants and a hole developed in the bottom. 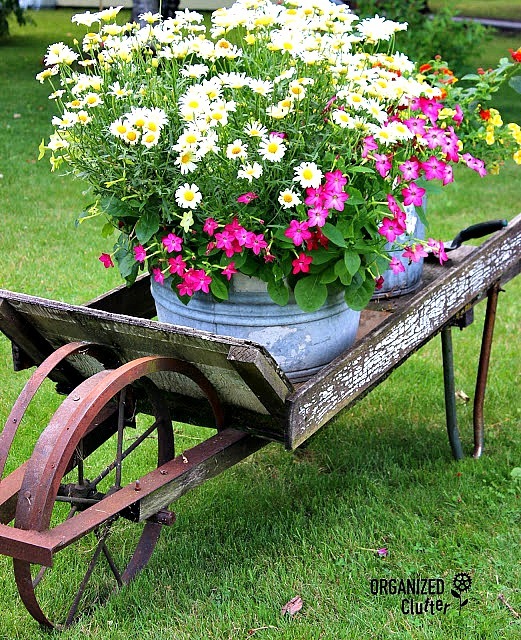 Last year I added a piece of plywood to cover the hole in the bottom of the wheelbarrow, and planted nicotiana and Marguerite Daisy Vanilla Butterfly. But the vigorous growth habit of the Marguerite Daisy, that I normally love about this plant, overpowered my nicotiana. We shall see how my 2017 nicotiana, Blue Arrows Rush Grass, and annual Phlox work in the round tub! By the way, this is how you deadhead a nicotiana to keep the plant blooming and looking its best. Pinch off the entire seed pod you see between my fingers or use your Fiskars Softgrip Micro-Tip Pruning Snip . The smaller tub has a re-run planting from 2016. Two Black Eyed Susan Lemon A Peel. 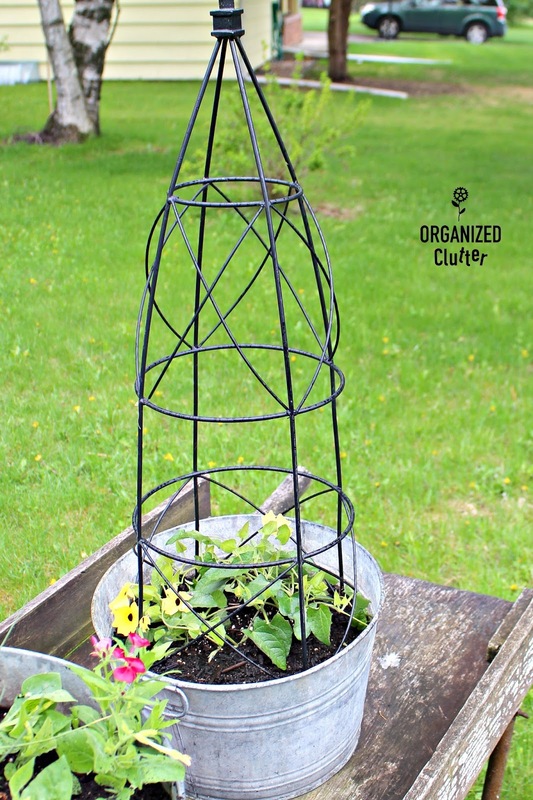 The obelisk trellis is 36" tall. Here are the Black Eyed Susan Vines from 2016 fully covering the trellises. 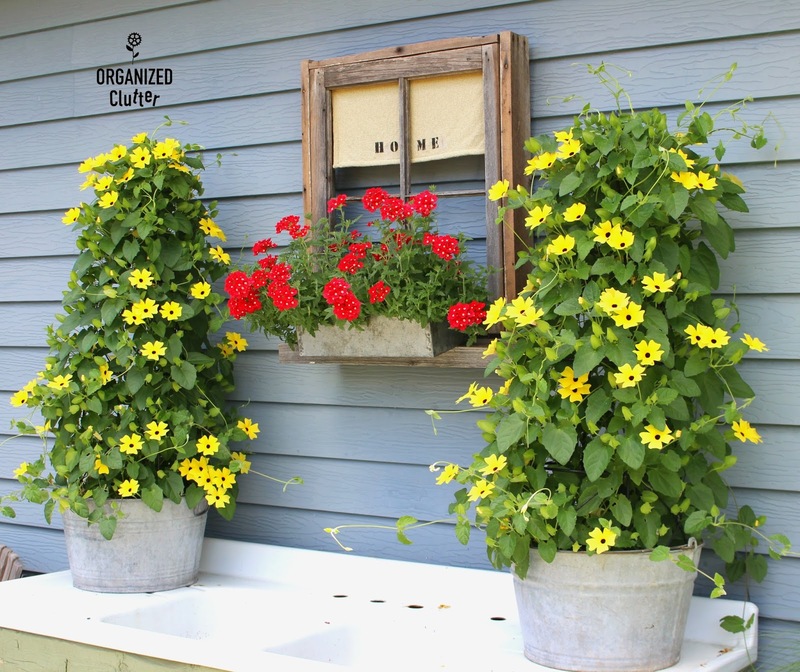 Do you grow Black Eyed Susan Vines or Nicotiana? 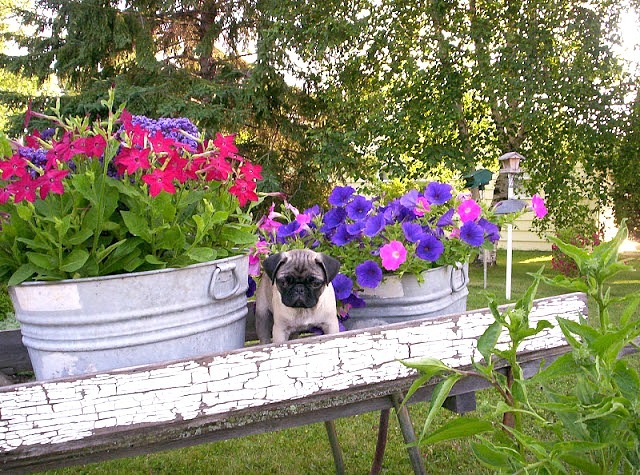 Thanks for sharing all the names of your plantings, Each year is gorgeous. and I'm totally smitten with your wheelbarrow! 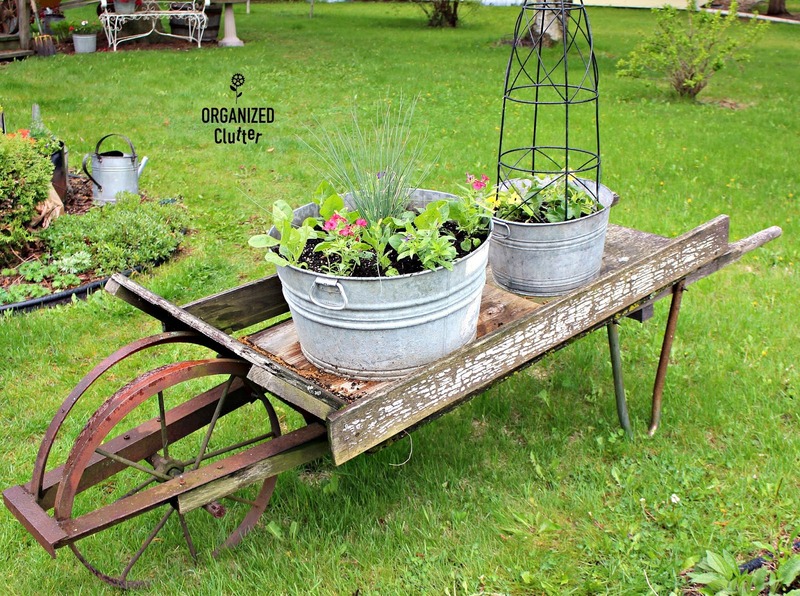 I wish I could find a wheel barrow like that.you have such neat ideas. I would buy sturff at a garage sale but due to all the rain around her I have not seen 1 garage sale this summer. Have a wonderful rest of the week and Happy Gardening - everything looks amazing.